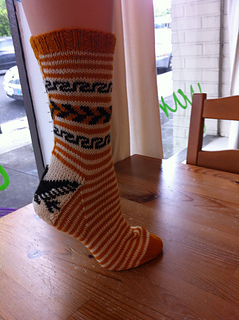 This is the Tour de Sock Stage 3 pattern. It is also available to everyone now! Times like these call for a Big Lebowski. “The Dude” wears a Cowichan-style Pendleton sweater in the film. 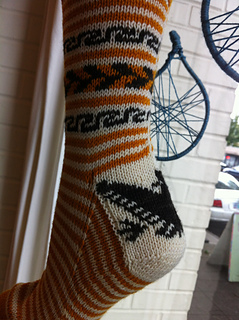 This sock is also in the Cowichan style and is made in honor of Lebowski: not a man, a way of life. Skill Level: This advanced-level pattern is knit in the round. 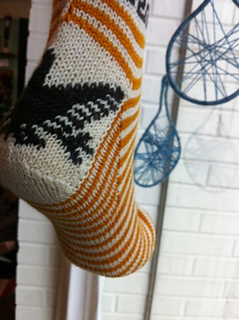 The ribbed cuff is knit first, the striped and stranded leg next, an intarsia heel flap, then a wedge toe. You’ll need to know how to cast on, knit, purl, increase, decrease, do colorwork, pick up stitches, and follow charts and written instructions. Notions: Stitch markers, yarn bobbins (for intarsia heel), tapestry needle. 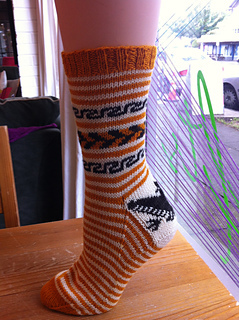 Yarn: You will need three colors of yarn to complete this project.